‘Firesticks’ Euphorbia is one of the most distinctive succulents you can have in your garden. Its unique branching habit, plus the striking foliage color, makes this succulent a lovely specimen in any setting. ‘Firesticks’ can be planted landscape beds or in containers. This euphorbia earns it name by the fiery stem and foliage color. While the standard pencil cactus is green in color, ‘Firesticks’ remains mostly yellow in the summer, with warm red tones emerging as temperatures cool. New growth may produce small leaves but they typically fall off shortly after emerging. While plants do flower, they are only occasional and inconspicuous. 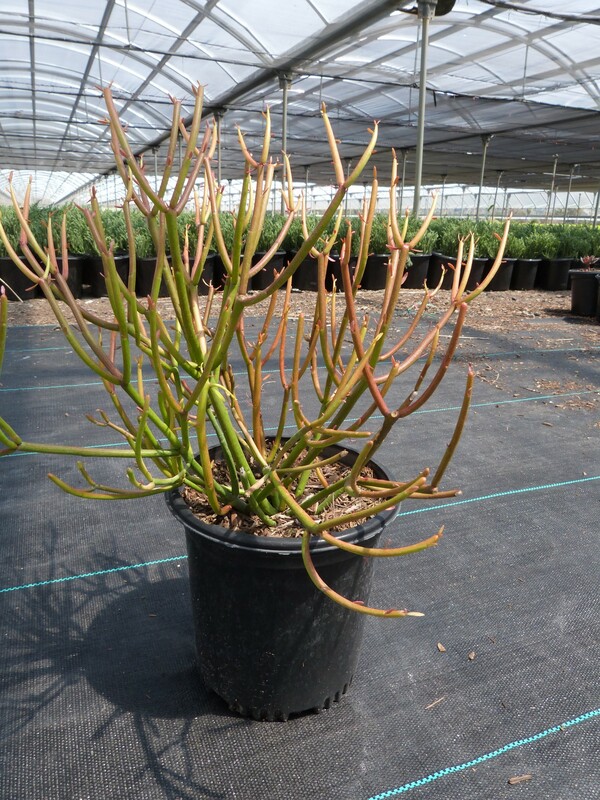 ‘Firesticks’ euphorbia thrives in well-draining soils and does not appreciate wet feet. Seasonal pruning will help maintain the shape of your euphorbia. When pruning make sure to use gloves to avoid coming into contact with the white sap as it can irritate your skin. Another consideration would be to avoid planting this in your garden if you have small children or animals. ‘Firesticks’ is a great choice for drought tolerant gardens and requires minimal water to get established. This plant does well in full sun but in intense climates where sun is strong, they appreciate some light afternoon shade. Planting ‘Firesticks’ in deep shade may reduce the intensity of the color feature and even revert to green. This interesting plant rarely has issues with pest or diseases.